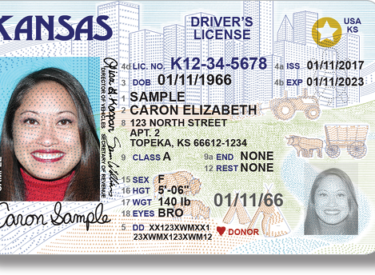 TOPEKA—Kansas has a new driver’s license design, specifically formatted to comply with approaching federal ID requirements for airport security purposes, three years early. New licenses issued will contain either a gold circle with a white star cutout proving lawful presence in the United States and designating it as acceptable federal ID, or the words “not for federal ID.” This complies with the REAL ID Act, a federal initiative that was approved by the U.S. Congress in 2005. To obtain a federally compliant “Real ID” credential, Kansans should bring proof of social security number documentation in addition to their birth certificate or valid U.S. Passport. If they do not have those documents on hand, they can choose to obtain the “not for federal ID” card that will not be acceptable ID for boarding domestic flights or entering designated federal facilities after September 30, 2020. However, the “not for federal ID” cards will still be valid as state ID or as a driver’s licenses.